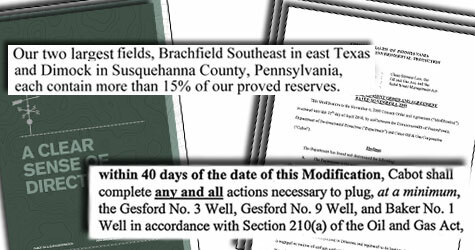 In its 2009 annual report, Cabot Oil and Gas named a field in Texas and another in Dimock, Pa., as its two largest fields of production. But yesterday the Pennsylvania Department of Environmental Protection ordered Cabot to plug at least three of its gas wells in Dimock and pay hefty fines after contaminating local drinking water. More than 15 months after natural gas drilling contaminated drinking water in Dimock, Pa., state officials are ordering the company responsible — Houston-based Cabot Oil and Gas — to permanently shut down some of its wells, pay nearly a quarter million dollars in fines, and permanently provide drinking water to 14 affected families.